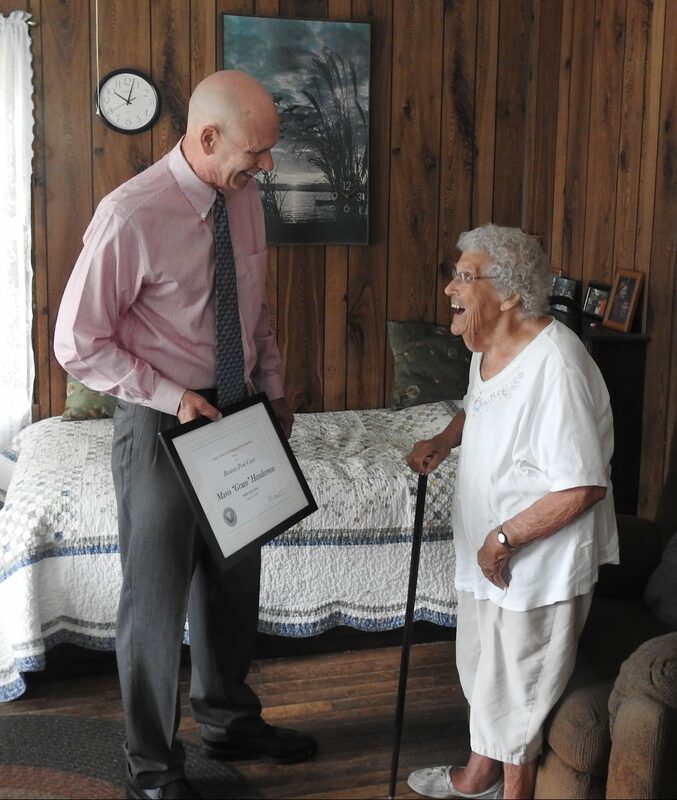 Mavis Henderson and Selectman Chair David Vincent share a laugh Friday morning. Henderson is holding The Boston Post Cane. PHILLIPS - The town's oldest resident received some special visitors Friday, as the town's selectmen dropped by with a new cane. 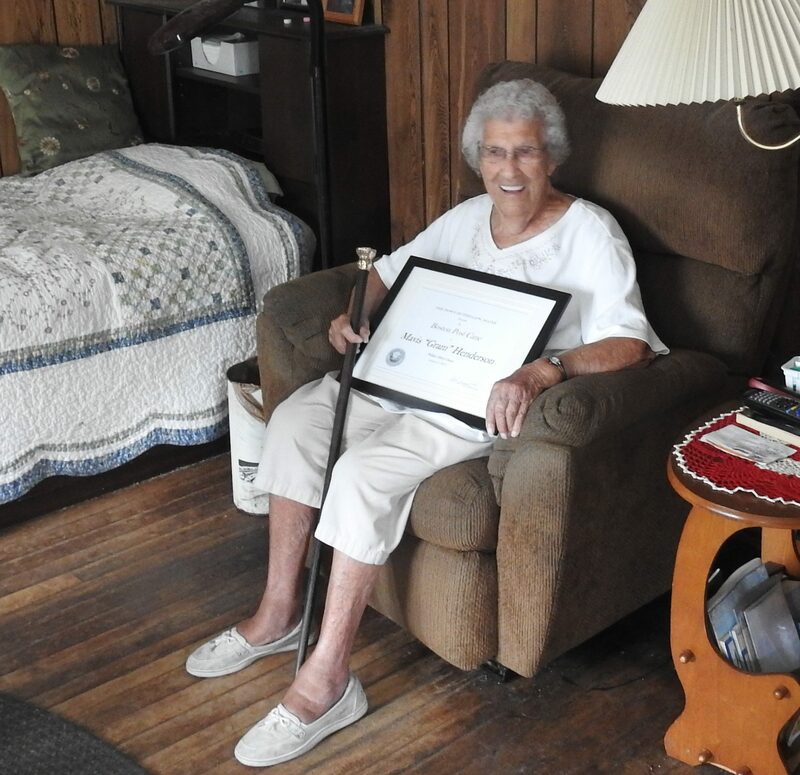 Mavis "Gram" Henderson, age 97, was given Phillips' Boston Post Cane in recognition for being the town's oldest resident. Seven hundred of the walking stick-styled canes were given to towns across New England in 1909 by the now-defunct Boston Post. Mailed to New England towns by the Post publisher as a promotion, the canes outlived The Boston Post, which shut down in 1957. Originally awarded to the oldest resident in each town, the surviving canes - or in some cases, replicas - continue to serve that purpose. "It's too long for me," Henderson noted, standing with cane in hand. Henderson has resided in Phillips since 1929. "It's tall for just about anyone, but it's a good looking cane," Selectman Chair David Vincent said. For several years, Phillips did not award the cane to any resident. The cane was eventually located in the town office safe and Vincent arranged for it to be polished prior to its presentation to Henderson. 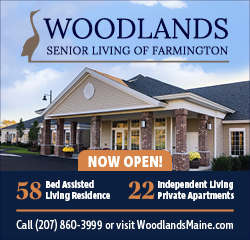 In addition to Vincent, Selectman Raymond Gaudette and Town Manager Maureen Haley were in attendance. In addition to the cane, Henderson was presented with a framed certificate. In addition to the history of The Boston Post Cane contained in the article, it's interesting to note that John Fox, also a longtime Phillips resident, was the last owner of the newspaper and was at the helm when the last edition was published in 1956. I neglected to link to it in the article, but Paul Mills wrote about John Fox back in 2009. Congrats Mavis ,my favorite custard pie maker!! Congratulations,Ma'am. May you wear that cane out and many more like it! Congrats Mavis..not only the oldest in town but the most sweetest person anyone could meet..
Mavis....my mother would be SO proud of you!!! Keep sharing your memories! It's great to see such a lovely lady being recognized by the community. She is the kindest person in the world and the most liked!!!! Congrat Mavis you are one of Kind, Phillips has been very lucky to have your here for 97 Years!! This website gives information about who received the cane in which town. The information from the town of Phillips is missing. Perhaps the town of Phillips would like to have this information added to this website. Congrats Mavis. Such a sweet lady who always keeps you smiling.